As defeats go, this was a bad one as Derbyshire lost by an innings as Yorkshire cruised to the top of the table. A defiant knock of 141 from Skipper Wayne Madsen couldn't stop the innings defeat that the Tykes deserved over the course of the three days. 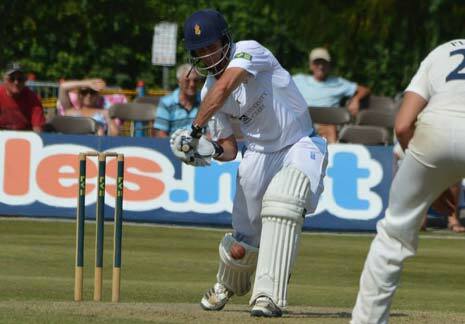 Derbyshire failed to see through the morning session without being bowled out. First to go was nightwatchman Mark Turner, who despite taking the score through to 120, found a leading edge to Andrew Gale. Despite the result for Derbyshire, what a beautiful setting to play first class cricket! Richard Johnson batted with some credit and was going along nicely before he was caught at short mid-wicket from the bowling of Adil Rashid for 46. Tom Poynton then joined Peter Burgoyne - and the two former academy players pushed the score along to 166 before Burgoyne fended at a length ball from Liam Plunkett and was caught behind for 15. Poynton continued to defy the Yorkshire batsman and he took a particular liking to Rashid who he hit for two consecutive boundaries. 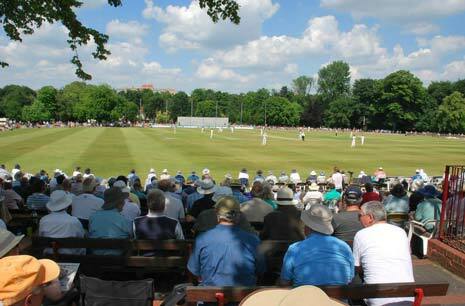 Groenewald also pounced on a bad ball from the leg spinner and sent the ball towards the bandstand. Groenewald brought up Derbyshire's 200 and a batting point, there were some concerns that Derbyshire were not able to get anything out of this match, but the South African's boundary changed that. Next ball and he was out leg before to Plunkett and Derbyshire were nine down for 202. Tom Poynton brought up his fifty in the 67th over by despatching Rashid to the boundary. 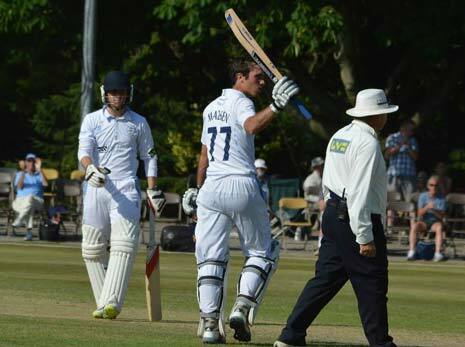 Poynton celebrated the fact by hitting him for two consecutive sixes towards the Lake. Rashid had his revenge - though not against Poynton - when Mark Footitt, who had played a lovely straight drive off Rashid earlier, was caught at first slip by Adam Lyth and Derbyshire were all out for 235. 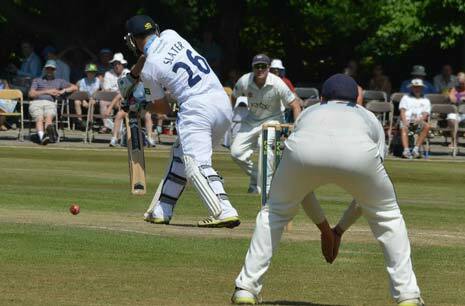 Yorkshire made the decision during lunch to enforce the follow on, and quickly Derbyshire were in trouble when Ben Slater (above) was caught driving at a ball by Jack Brooks for just 1. The score had moved along to 30 when Chesney Hughes flashed at a wide delivery by Brooks, Lyth parried the ball at second slip, the ball looped up to first slip where Gary Ballance took the catch. Steven Patterson was just getting the ball to move a little and he accounted for Wes Durston who was clean bowled, leaving the ball for just 2 and Dan Redfern continued his poor form with the bat, when he found a leading edge to Gale at mid-off. As ever with Derbyshire in their two innings, batsmen got in and got out and Richard Johnson was one of those, playing some lovely shots but found a rising ball from Steven Patterson, edging behind to Hodd who took his sixth catch of the game. After a promising Championship debut with the ball, Peter Burgoyne couldn't add to his promise with the bat when he was bowled by Ryan Sidebottom for 18 just before Tea. His time will come! Derbyshire skipper Wayne Madsen (above) had provided some useful resistance to the Yorkshire attack and he brought up his fifty from successive boundaries from Patterson. Madsen and Poynton shared a magnificent partnership at Northampton last season to save the match and, although there were no thoughts of that in this innings, Madsen (below) upped his rate for his next 50 runs and brought up his 100 from 139 balls, including 18 fours. Poynton had allowed his skipper to have the free role but hit the boundary to bring up the hundred partnership between the pair. However, the young wicket keeper, who passed 700 first class runs during his innings, drove straight to short extra cover where Plunkett took the catch. Poynton made 29. Madsen played superbly well - he dominated the strike, only leaving the odd ball for Tim Groenewald to face. Groenewald had a life when he was on 10 when Adam Lyth dropped him at second slip from the bowling of Plunkett. The former England bowlers and Yorkshire's frustrations were apparent. Ryan Sidebottom was brought on from the Lake End, and he immediately claimed two wickets in an over, first of all trapping Groenewald leg before and then bowling Mark Turner for 0. Yorkshire claimed their innings victory when after a stubborn battling innings from skipper Wayne Madsen, he smacked the ball back at Liam Plunkett and was caught and bowled for 141. Madsen had faced 194 balls and hit 26 fours. The Skipper post game was disappointed, but full of praise for Yorkshire, "Our squad can learn a lot from this Yorkshire side, they didn't give us much and they were relentless. "Our best chance to survive today was to be positive and try to put pressure on the bowlers. Liam Plunkett was excellent! He played with me for the Dolphins in South Africa and he was really good today." Madsen played aggressively for his 141 and he felt that was the way to go, "Richard Johnson got a decent ball that he got out to and I wasn't going to hang around for that, so I played in a positive fashion. "Tom Poynton (above) batted well and we put on over a hundred and there was shades of Northampton last season." Two players stood out in the match for different reasons but both players at the start of their careers. 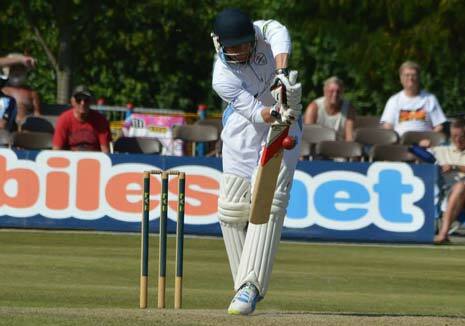 Alex Lees' superb knock on days one and two had the Derbyshire players scratching their heads, "We didn't know where to bowl at him, he was playing the ball so late and didn't give us many chances. He was very disciplined, he looks a really great prospect." Madsen was also keen to state how well that Peter Burgoyne played on debut, "He did really well. He has the potential to be a really good all-rounder, he could have got more wickets and with the bat, he did well."